Don’t let the myths about hardwood flooring prevent you from enjoying this classic, beautiful flooring option. When it comes to flooring, no other option can match the beauty or classic appeal of hardwood floors. Hardwood flooring is a timeless option that will never go out of style, but unfortunately, there are many myths that surround it, some of which keep people who could benefit from hardwood floors from ever even considering them. At Floor Expo, we are dedicated to helping you find the right flooring option, and to us, that means informing you about all of your options. That’s why we’ve set out to debunk the most common myths about hardwood flooring. Myth #1. Hardwood floors are unaffordable. While it’s true that hardwood floors can be a lot more expensive upfront than other flooring options, when you consider how long they last, they become much more affordable. How long your hardwood floor lasts will depend on many different factors, including the quality of materials you select, how well you care for your floors and even the subfloor it sits on. Typically, hardwood floors will last 25 years or more, but, if you make it a point to take great care of your floors, they could last a lifetime. Carpet, for example, is cheaper to install but only lasts about 10 years. Myth #2. Hardwood floors are scratched easily. Whether from moving furniture or from your pet’s paws, yes, you will probably experience some scratches every now and then with hardwood. But, wear and tear is not unique to hardwood floors. What is unique to hardwood is the ability to erase wear and tear, like scratches, with a new finish. In the vast majority of cases, what gets scratched is not actually the floor itself, but the finish. A simple maintenance finish can alleviate these scratches. But, even deeper scratches that reach the hardwood itself can be buffed out when you refinish your floors. Myth #3. Hardwood floors are high maintenance. The simple fact is that hardwood floors are much easier to maintain than carpet and some other flooring options. 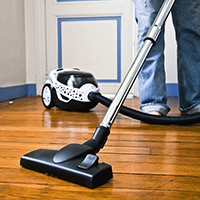 There are a variety of methods you could choose to use for the day-to-day maintenance of your hardwood floors, such as sweeping, dusting, mopping or even vacuuming (just make sure you turn the beater bar off). The only thing cleaning methods that need to be avoided are those that introduce too much water to your floors, like steam mops or wet mops. And, if your floors start to look a little lifeless, use a wood flooring cleaner every once in a while to give it back its luster. Myth #4. Hardwood floors are overly noisy. Hardwood floors don’t absorb sound like carpet does, and that fact will never change. However, that does not mean that hardwood floors are overly noisy. In fact, the flooring in your home will play only a small role in its noise level, and there are other things you can do to reduce the noise, like investing in rugs and curtains. Myth #5. Hardwood floors are cold. While it’s true that your hardwood floors won’t provide as much warmth as carpet will, it’s a myth that it won’t retain any heat or that your feet will constantly be cold with hardwood. Hardwood will absorb the warmth coming from the sun and your HVAC system. And, hardwood is much more insulating than some other materials. For example. hardwood insulates 10 times more effectively than aluminum or steel, and five times more effectively than concrete. 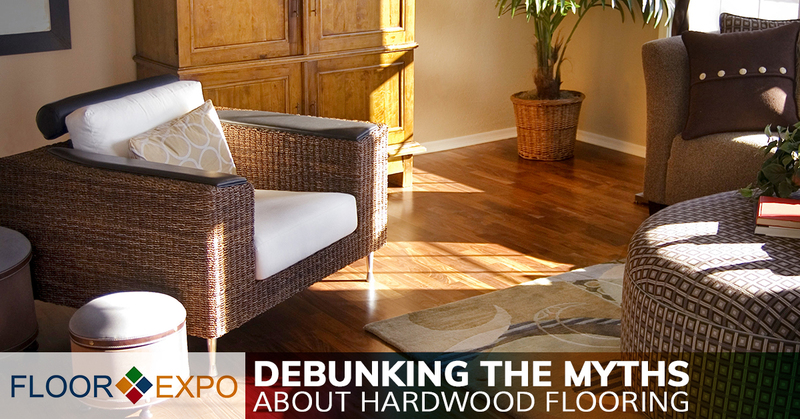 Would you like to learn the truth about more hardwood flooring myths? If so, please stay tuned for our next blog! in the meantime, contact us for your free design consultation!